Samsung technology brings innovation home. 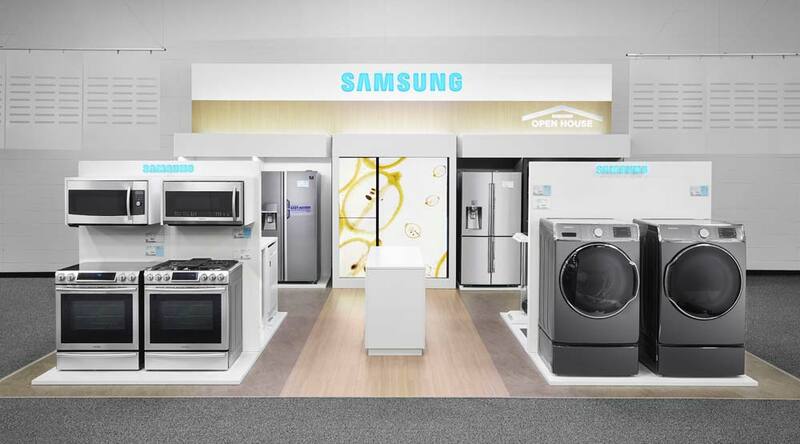 Let the latest Samsung appliance designs help you spend less time on laundry, organize your refrigerator in new ways, improve your cooking experience and even make washing the dishes a snap. 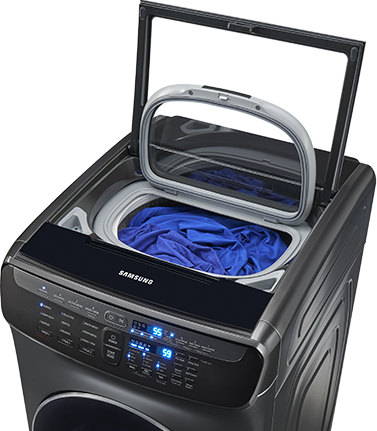 The FlexWash washer contains two separately controlled washers with separate settings and options that let you do two loads at the same time. The FlexDry dryer lets you flat-dry delicate garments while simultaneously drying your everyday clothes. ActiveWash washer with built-in sink. 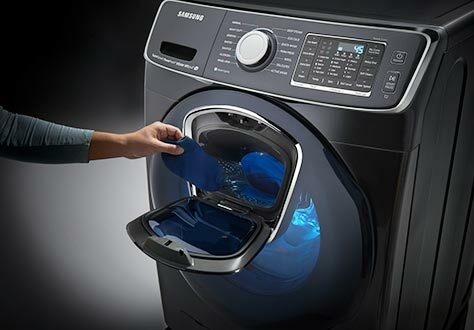 Samsung's ActiveWash top-loading washer allows for larger loads so you can spend less time doing laundry. The built-in sink lets you pre-treat and pre-soak your clothes with ease, while Super Speed technology lets you power through laundry day 35% faster without sacrificing cleaning performance. With Vibration Reduction Technology, wash loads stay balanced and quiet even at high speeds. 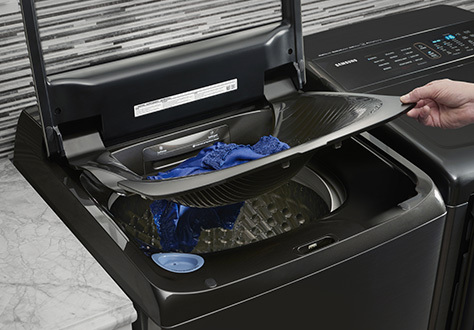 Use the AddWash door to conveniently add forgotten laundry after the cycle has begun. 5.0 cu. ft. capacity lets you get more laundry done in less time. Finish your laundry in just 30 minutes with Super Speed. Family Hub refrigerator with touchscreen. Make the kitchen the center of your home. Family Hub helps you manage your home and your life with Food Management, Family Connection and entertainment capabilities — all controlled from a 21.5" Wi-Fi–enabled touchscreen on a beautiful counter-depth, 4-Door Flex refrigerator. Flex Duo with dual-door slide-in range. Cook two different dishes at different temperatures simultaneously. Blue LED illuminated knobs visually let you know if your cooktop is on, even at a distance. 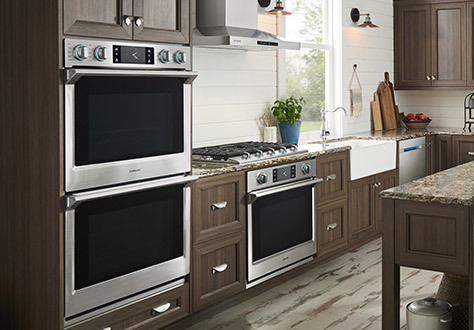 Wi–Fi connectivity lets you remotely monitor your cooktop and control your oven. The Samsung Chef Collection was created with innovations that work together to revolutionize how food is stored, prepared and presented. Because professional chefs never compromise, and neither should you. Over-the-range microwaves with the PowerGrill feature provide a direct grilling element at the top of the microwave to toast, crisp and brown your favorite food in minutes. Large, 1.9 cu. 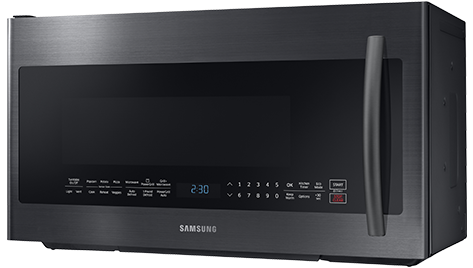 ft. countertop microwaves with Sensor Cook technology allow you to automatically adjust cooking time. The Waterwall linear wash system with powerful streaming wall of water delivers remarkable cleaning results as it maintains maximum pressure from corner to corner. The AutoRelease door opens automatically to circulate air and accelerate drying time, while a third rack provides additional loading capacity. 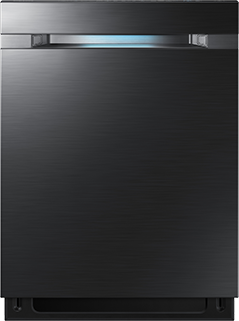 Zone Booster uses custom settings for certain areas of the dishwasher to wash delicate dishware and tough-to-clean pots all in a single load. 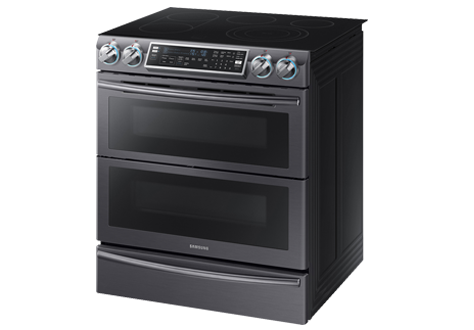 The Samsung collection of built-in wall ovens, cooktops and range hoods showcase smart features and modern designs that will bring your kitchen into the future. Powerful suction on this robot vacuum delivers optimal cleaning on all floor types. Effortlessly cleaning pet hair, dirt, dust and more, it lets you enjoy a clean home on a regular basis. at Best Buy stores or Pacific Kitchen & Home stores inside Best Buy.